- According to the survey, consumer’s complaints were made for lack of basic service systems. Korean Federation of Housewives Club (President: Kim Cheon-ju) conducted a survey during September with 600 consumers over 20 years of age and using the broadcasting and information super-highway provided by general broadcasting companies to examine the realities of the general usage, problems with the usage, satisfaction, etc. Regarding the status of the subscribers of the cable broadcasting; as of March 2007, the number of subscribers is 14,215,104, which is 77.6% of the total households (according to Korean Cable TV Association: KCTA). Though cable broadcasting is being recognized not as an optional device to solve the problem with watching TV in a fringe area (where reception is poor) but as an essential device of TV viewers, in the survey with the actual users of the service 52.5% of the subscribers of cable broadcasting responded that the main purpose of their subscription was to solve the problem of poor reception, which shows the ironical realities of the double payment of television subscription fee. General cable broadcasting companies have expanded their business to the area of information super-highway and as of Sep. 2007, 16.9% (2,464,977 persons) of the total subscribers of information super-highway (14,590,971 persons) are using the service that is provided by the cable broadcasting company and thus the realities of the general cable broadcasting companies that are providing both cable TV and information super-highway were examined to give consumers good service and useful information. The following are the detailed results of the survey. It is shown that 32.5% of the respondents of the survey signed on a contract for 3 years’ usage, and 27.4% did not sign on any contract for usage while 17.4% did not even know if there exists such contract system. Though 58.3% of the respondents said they received the contracts, 15.6% did not receive them and 26.2% did not even remember whether they received the contracts, which shows that they do not recognize the importance of the written contract in time of the signing of the contract for the service. Especially, in the case of the people who signed on the subscription contract only 52% of them received the contract, while 84.7% of the people who began the subscription before 2007 received the contracts. So the rate of the receipt of the contracts increased considerably after the implementation of the policy of the obligatory delivery of the grant of the subscription contract effective from 2007. Regarding the usage clause, only 45.4% said they received it and 33.6% do not recognize whether they received it. So consumers did not recognize the receipt of contracts or usage clause sufficiently. (1) Experiencing trouble with the service: 52.8% of the users of the service said they experienced difficulties while they were using the service, and only 19.7% said they were satisfied with the works of the concerned companies for the treatment of the solution of the complaints while 43.2% said it was so and so, and 25.4% said it was not satisfactory. So altogether 68.6% were dissatisfied. The reason for the dissatisfaction with the solution of the complaints about service trouble was: 32.0% for the problem with the connection of telephone, 24% for the recurring trouble after the hindrance, and A/S 20.8% for not keeping the appointment of A/S visit. Thus it shows that the reason for dissatisfaction was not technological aspects but the poor performance with the basic functions of the counter to solve the complaints of consumers. (2) Satisfaction with the charge for the service: Regarding the satisfaction with the monthly charge for the service; 37.8% were satisfied and 40.9% were not satisfied. Regarding the question if they were ever requested for price increase while they were using the service of cable broadcasting; 43.1% said they were asked for the price increase, and 41.1% said they were not. Among the consumers who were asked for the price increase, 29.5% said they accepted it since it was obligatory and 13.6% said they rejected it because it was optional. The higher the age of the respondents, the more they accepted it because they thought the price increase was obligatory. 52.5% said that they installed it because they cannot watch TV if they do not subscribe the cable TV, and 32.9% said they installed it to watch various TV channels. In the case of the people living in a fringe area where reception is poor they are paying both television subscription fee and the cable TV subscription fee even though they need to be exempted from the TV subscription fee. 80.3% of the total respondents said they set an obligatory contract period between 1 to 3 years, and only 10.9% of the total respondents did not set any obligatory period. It appeared that 37.5% were given free gifts when they began to subscribe the service. For gifts for the subscription of the service, 20.8% received free usage coupon for a certain period, followed by various kinds of gift certificates (19.8%), computer peripherals(10.4%) and the redemption of penalty for other communication companies(9.0%). For a question if they were given the promised free gifts, 59.4% of the consumers said they received them on the promised date, 27.5% said they received the gifts later than the promised date, and 8.4% said they were considering canceling the contract giving up the gifts. While 67.2% of the total respondents received the contract, 20.4% did not recognize the receipt of the contract and 12.4% answered that they did not receive it. Regarding usage contract, 53.6% said they received it and 28.5% did not know if they received it. Thus they do not recognize the receipt of the subscription contract or the usage clause and may have difficulties when they want to cancel the contract or have complaints with non-fulfillment of the contract. (1) Experience of problem with the service It turned out that 61.6% had problems with the service and 21.2% were satisfied with the treatment of the complaints when service problems occurred, while 69.1% said they were not satisfied. 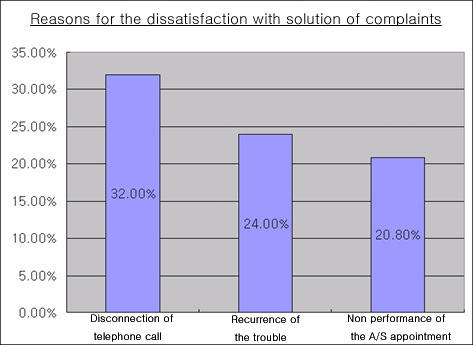 (2) Reasons for the dissatisfaction with the service The highest ratio of the reason (32.9%) was that telephone was not connected with the concerned company, followed by the recurrence of the problem (32.1%) and non-fulfillment of the promise to visit for A/S (20.7%). (3) Satisfaction with the service price 36.8% said they were satisfied and 40.8% said they were not satisfied. The highest ratio of the reason (52.7%) was that the price was cheaper than other communication companies and the next (17.6%) was that they did not have any other alternative because the region was monopolized by a certain company. 1) Among the households that watch TV, about 80% are using the service of cable broadcasting companies (as of Mar., 2007, 77.6% of the total households are subscribing) and 16.9% of the people who use the information super-highway are using the service sold by cable broadcasting companies. Such ratio of the subscription of cable broadcasting company means that it is not an optional service but an essential device for watching TV. Most consumers say they cannot watch TV without cable broadcasting service which means that they are living in a fringe area where reception is poor and thus they must be exempted from the fee for public TV. Some suspect that cable TV companies have made it impossible to watch TV without the cable TV. Cable TV companies are monopolizing the regional service and restrict the choice of consumers. In this regard, it needs to be examined if their service is really satisfactory. 2) In the survey, 37.8% of the respondents who are using the service of cable TV said they were satisfied and 40.9% said they were not satisfied. Moreover, 29.5% said they had no choice but to accept the request of the price increase which shows the arrogance of cable broadcasting companies. 3) There are also many problems with the system to solve the service hindrance. 19.7% said they were satisfied with the results of the treatment of the service hindrance, and 68.6% said they were not satisfied. The No. one reason for the dissatisfaction was not a technical problem but the failure to connect phone call which shows that the basic function is not being provided. 4) The answer of the users of the information super-highway provided by cable broadcasting companies is similar. The answers to the question related to free gifts show the continuance of abnormal business patterns. 9% said they were promised to be redeemed for the penalty for the cancellation of the service of other communication companies for free gifts. For the treatment of service hindrance, 21.2% said they were satisfied and the No. 1 reason for dissatisfaction was also the failure to connect phone call with the service counter just like the cable broadcasting company. 5) In the survey, regarding the usage of the cable TV or information super-highway services, there were problems with the process of contracting for consumers in addition to the abnormal business patterns of the companies and the lack of basic counter function. So consumers need to pay attention to this matter. For example, though it is a basic matter to give subscription contract or usage clause when consumers join the service of cable TV or information super-highway, 26.2% of the users of cable TV and 20.4% of the respondents who use the service of information super-highway did not recognize if they receive the subscription contract. Most of the complaints of consumers are related to the period of the obligatory subscription signed when the contract was signed or the non-fulfillment of the promise to grant free gifts which can be solved without damage to consumers if consumers are keeping the contract or the clause. Nevertheless, consumers often neglect to keep them and thus they need to carefully keep the contract and the clause for their rights.